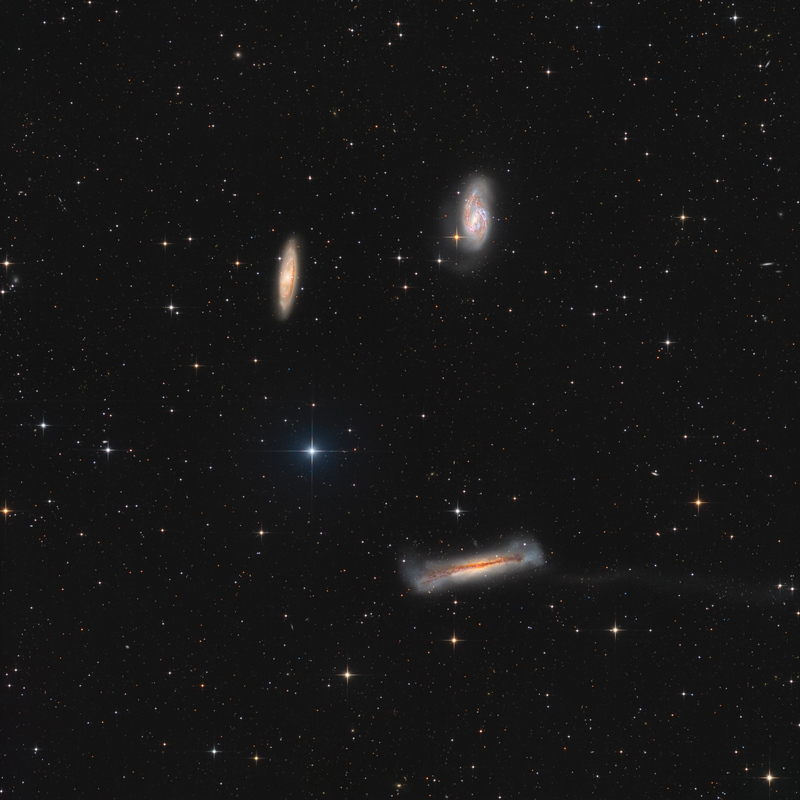 The Leo Triplet (also known as the M66 Group) is a small group of galaxies about 35 million light-years away in the constellation Leo. This galaxy group consists of the spiral galaxies M65, M66, and NGC3628. The trio are true interacting neighbours and are likely linked with two other nearby Messier galaxies. The upper left of the three galaxies is M65 – a spiral galaxy that seems to have suffered the least damage from the galaxies’ encounter. To the right of M65 is the barred spiral galaxy, M66. This galaxy displays more consequence from the gravitational collision, as the galaxy’s spiral arms are clearly deformed and the colorful arms are indicative of a high rate of star formation. The third galaxy of the Trio, NGC3628 – also nicknamed the Hamburger Galaxy, is an edge-on unbarred spiral galaxy at the bottom in this image. NGC3628 may be the most affected of the three galaxies, as this image shows its impressive tidal tail. Astronomers believe that the tidal tail is a result of the gravitational impact, and it consists primarily of young blue stars. The tail extends from the galaxy for over 300,000 light years. Due to its extreme faintness, the tidal tail is not commonly shown in photographs of NGC3628.